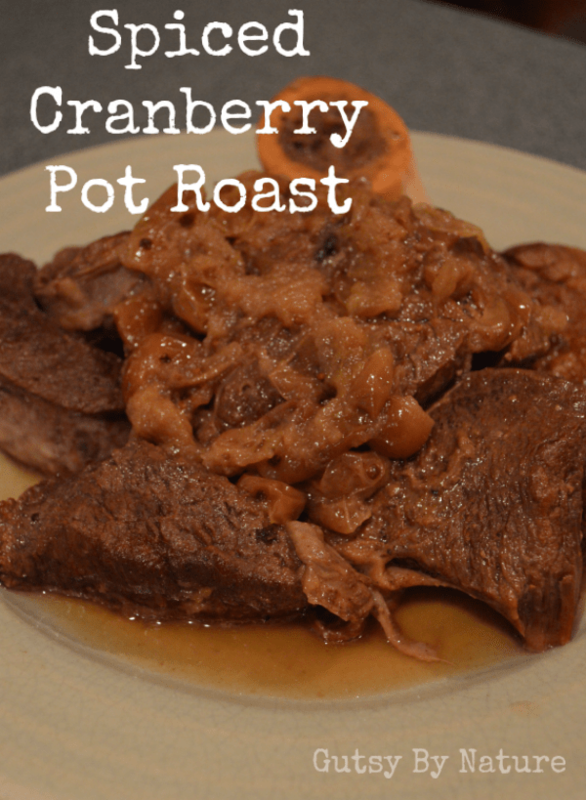 This recipe for cranberry pot roast uses the pressure cooker function of the Instant Pot, which is the feature I use the most often, though I’ve started using the rice cooking feature with some frequency now that I have added white rice back into my diet rotation. It is based on a recipe from a lovely cookbook I recently reviewed, The Kitchen Ecosystem by Eugenia Bone. It is in the cranberry section and uses a gentle stove top braising technique, so if you think this recipe sounds yummy but you don’t have a pressure cooker, check out the original in Bone’s book. My only complaint about this dish is that I wish the photographs had turned out better. One thing the pressure cooker does NOT do is create dishes that make pretty plates! Plus, it is always dark this time of year when I’m cooking and photographing (blogging is just my part time avocation – I have a full time day job too) and natural light makes a big difference. 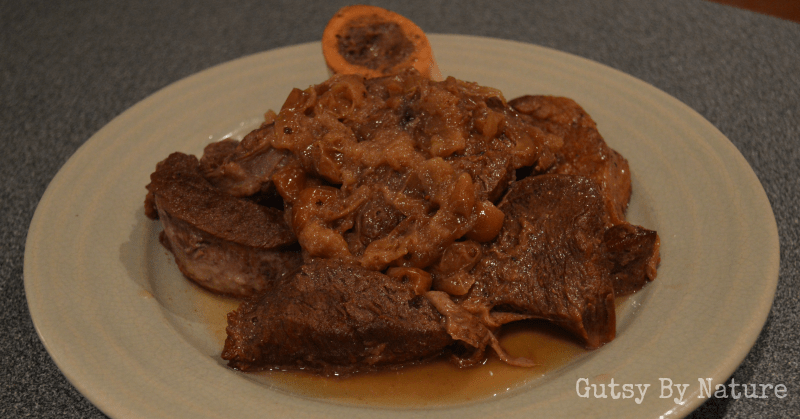 Please excuse/ignore the ugliness of these pictures and give this recipe a try anyway! This recipe is excellent for virtually any healing diet. 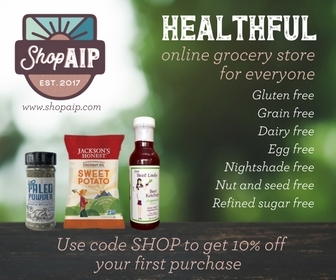 Not only is it free of most of the foods that are eliminated on the various diets (nightshades, nuts, eggs, starches, etc.) and low-FODMAP, but it is packed with superfood nutrient density from the bone broth, cranberries, and grass fed bone-in beef cut. If you use an arm roast like I did, you’ll also end up with a delicious couple spoonfuls of bone marrow (I didn’t share… figured it was cook’s privilege!). Paleo Autoimmune Protocol (AIP) or The Paleo Approach: Cloves and black pepper are both stage 1 reintroduction foods. Omit these to make this recipe AIP elimination phase friendly. Specific Carbohydrate Diet (SCD): This recipe is SCD legal as written. Low-FODMAP: Cranberries are low FODMAP, so this is a great recipe for people with FODMAP sensitivities. Omit the garlic. I used a 3 pound bone-in beef “arm roast” from my favorite local grass fed farm. It was wider than the bottom of my Instant Pot, so I cut it into two pieces and browned each piece separately in the first step. Arm roast might also be labeled as beef chuck arm pot roast, arm chuck roast, round bone pot roast, or round bone roast (names of beef cuts are so confusing!). Fresh or frozen cranberries will work just fine. I used powdered horseradish from Penzey’s Spices, because that is what I had on hand. If you have prepared horseradish in your refrigerator go ahead and use a couple tablespoons of that instead. The pressure cooker makes this recipe for spiced cranberry pot roast easy, fast, delicious and extra nutrient dense. Pat meat dry with paper towels and season generously with salt and pepper. Press "saute" button on Instant Pot (or if using stovetop pressure cooker, place over medium-high heat) and heat oil until shimmering. Brown roast on all sides, 8-10 minutes total. Remove and set aside. Pour wine into empty pot and use wooden spoon to scrape up brown bits. Allow to cook for 4-5 minutes, stirring constantly to deglaze the pan. Add cranberries, water, honey, horseradish powder, cinnamon stick, garlic, and whole cloves. Cook for 4-5 minutes, stirring constantly, or until cranberries start to burst. Return meat to pot, nestling it into the cranberries. Add enough bone broth to bring liquid level to nearly, but not completely, cover the meat. Lock lid in place. Program Instant Pot to cook under high pressure for 75 minutes (if using stovetop pressure cooker, bring to high pressure over medium-high heat, then reduce heat to medium-low and cook for 75 minutes, adjusting heat as needed to maintain high pressure). Turn Instant Pot off immediately after 75 minutes and let the pressure release naturally for 15 minutes (if using stovetop pressure cooker, remove pot from heat and allow pressure to release naturally for 15 minutes). Quick release any remaining pressure. Transfer meat to serving platter and pour some of the cranberry sauce over top. Reserve the rest of the cooking juice to pass at the table.